Are you ready to take your denim game to the next level? Give your baby blues a break and wake up your wardrobe with a fresh pair of on-trend white denim. By switching them up with some different styles, it’s sure to be the one item you wear on repeat this season. Here’s how to style your white denim. What shirts can be worn with white jeans? Build your look around the printed embroidered blouse trend and a pair of brightly colored sandals. Give your usual purse a vacay and stash your essentials in a straw bag instead. Stylist Tip: Have a pair of white jeans that are too sheer? An easy way to beat underwear lines (and mask lumps and bumps) is to don a pair of skin-colored shapewear bottoms. It’s time to bust out the seasonal version of a Canadian tuxedo by matching your whites with a denim jacket. Bonus points for throwing on a chambray top underneath for a denim times three ensemble. Make monotone anything but monotonous by going for a white tonal look with your jeans. 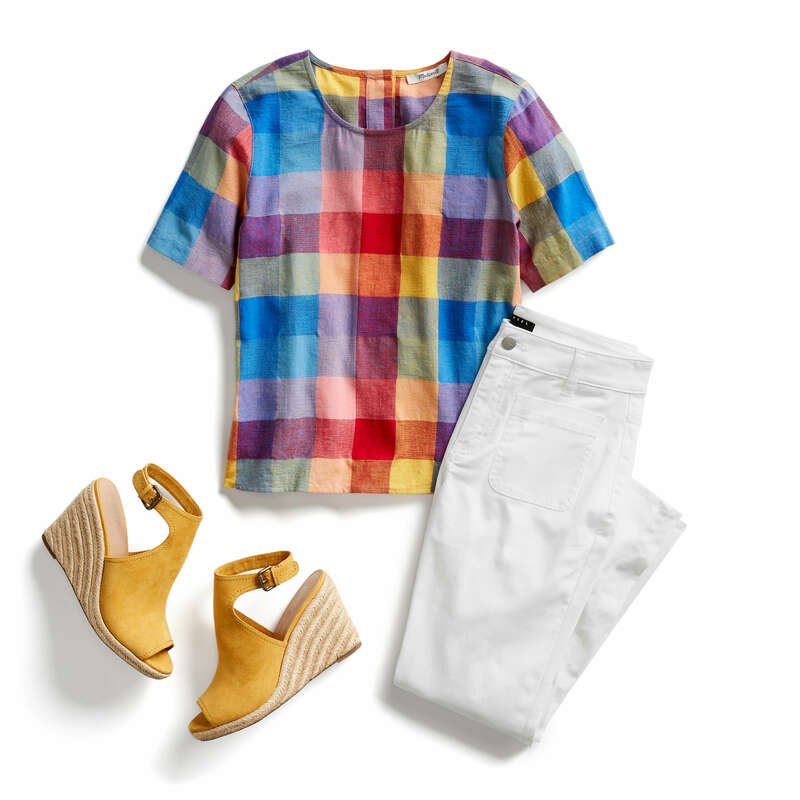 These head-to-toe brights will get a boost from a soft blush shoe to finish your outfit. What shoes go with white jeans? Take your jeans out for a stroll with a pair of crisp white skinnies to add instant elegance to your everyday looks. Try pairing them with a striped shirt and an easy pair of colorful flats to brighten up your outfit and your footwork. Need a lift? Heels will instantly elevate your outfit (and your height!) in a snap. Embrace your edgy side by donning a knit moto jacket, wrap-front top, and embellished heels with your denim. And don’t be afraid to deep-dive into distressed looks, whether it’s mild like those with a scissor hem, or heavy with a full-leg fray. Stylist Tip: Head over to our post on how to keep your white denim clean to get the most mileage out of your new denim. What’s your favorite way to style white jeans? Tell us in the comments!